With so many models on the market, it can be hard to find the best RC cars for sale in 2019. Amazon has thousands of different options with features and jargon that may be unfamiliar to new drivers. For the uninitiated: RC vehicles are trucks, cars, and any other type of vehicle that are powered by batteries or by gas. They are controlled using a special remote or transmitter from a distance and are a ton of fun. 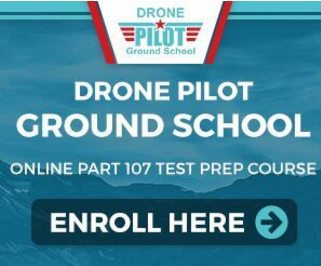 They work by receiving the signal from the transmitter or remote’s radio wave to the RC vehicle’s antenna and circuit board, or whatever setup the model has for receiving the signal. This further activates the motor inside of the RC vehicle and links it up with the transmitter or remote. Once the signal has been successfully received and properly synced up you’re free to drive it as you choose. Not sure what type of car you’re looking for? Don’t want to bother reading through all those RC car reviews? That’s why we’ve highlighted the following five models as the very best remote control cars for sale – vehicles that work great for beginners or experienced drivers, and which are hallmarks of quality across all areas. 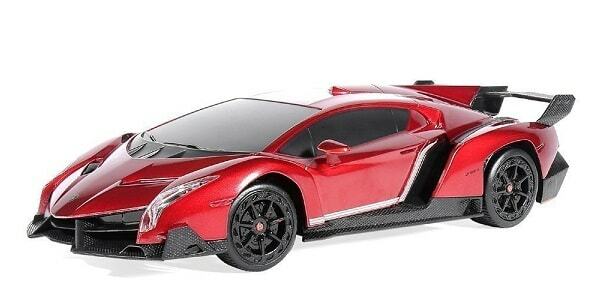 Traxxas is the most popular RC car manufacturer in the world. Just about any list of the best RC cars is going to have a Traxxas model at the top – the only question is which one. At Dronethusiast, we prefer the Traxxas Rustler to the company’s other vehicles. 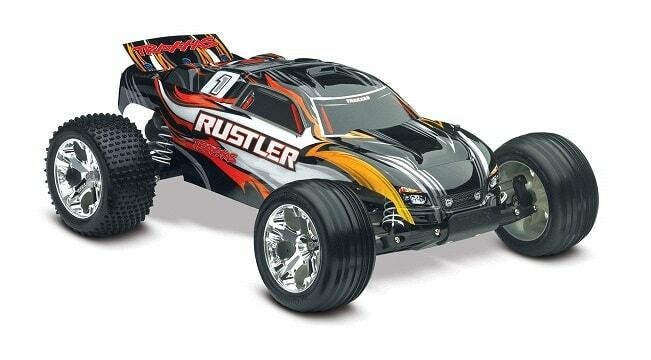 The Rustler gives you better hardware in most categories at a lower price, can reach speeds of up to 35 miles per hour, is highly durable, and drives well in any weather or terrain conditions. 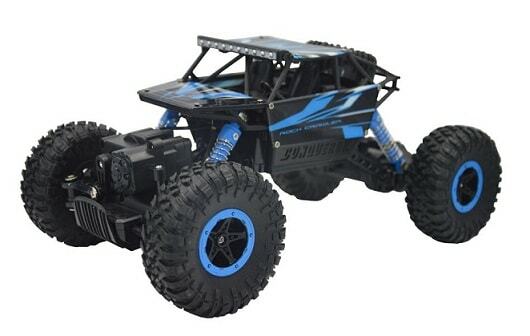 This fully-equipped all-terrain RC monster truck is a durable, waterproof choice that won’t let you down even in the toughest conditions. The body is made of precision aluminum and super-tough steel that won’t quit even with the roughest play. 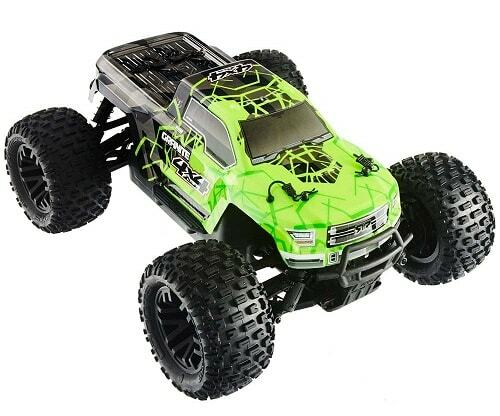 This hobby-grade truck is perfect for fans who aren’t afraid to get dirty and take part in some dirt-blasting, rock-crushing fun with one of the most durable and best RC cars on the market. 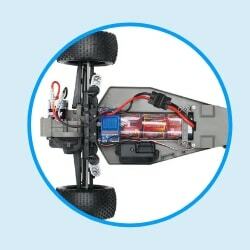 • Extremely durable steel and aluminum body covered in a waterproof coating allows this RC vehicle to still operate even after a rough crash or in bad weather. This RC car is awesome for indoor use. Though the range isn’t excellent and the battery time isn’t that long, it’s still great for some recreational fun with your kids. 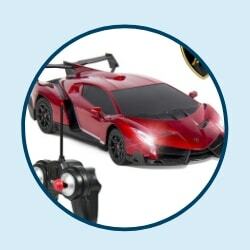 Plus, it’s cheaper than almost any other remote control car on the market. It’s perfect for those who want something small, yet very flashy, to drive around the house to kick some boredom. This gorgeous RC vehicle is both easy on the eyes and a lot of fun to drive. It comes in silver and red and runs on 5 batteries total. 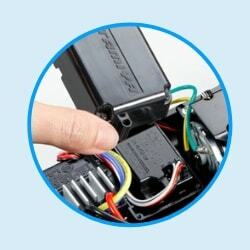 You will need 2 AA’s for the remote control and 3 AAA’s for the car itself. For those who want something that’s both an off-road RC vehicle and one that includes some serious speed, we’ve found your perfect match. This electric-powered RC truck is quite a marvel. If you’re looking to channel your inner speed demon, this RC truck can definitely help you do it! Some of us are looking for serious racing vehicles when we buy an RC car. Others just want something that’s colorful and fun to drive around or play with. If you’re one of the latter, here are the best RC car toys of 2019. Read more Remote Control Care for Kids Reviews here! 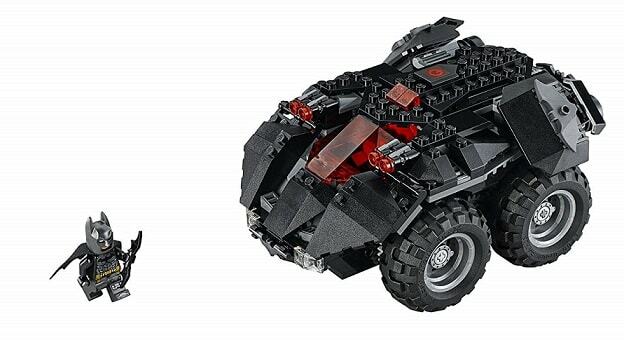 This LEGO RC car has decent specification, but is generally technically unimpressive. This is going to be the pattern for our entire RC car toy section. However, what it lacks in pure power it more than makes up for in fun gimmickry. 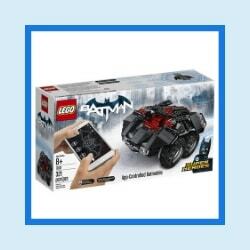 I mean, you get to BUILD a cool car out of LEGOs (a Christopher-Nolan-inspired Batmobile, no less), but you then get to really drive it using a mobile phone app that’s great for beginners. This car also has stud-firing missile cannons and can perform several simple stunts right from the phone app. What could be cooler than that? Few images are as instantly iconic as the Barbie convertible. Variations of this classic toy car have been around since 1962! Naturally, the advent of modern technology has turned this toy from a hunk of plastic to a remote control car that’s fun for both the young and the young at heart. 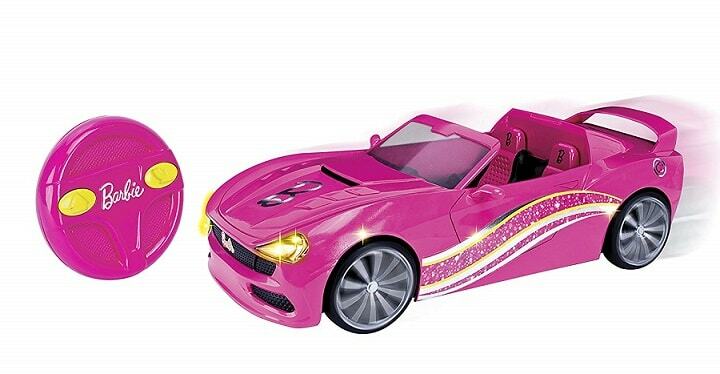 This particular car is a Nikko model manufactured by Toy State and officially licensed with the Barbie name and design. It doesn’t come with a doll (despite the deceptive Amazon picture), but it’s designed to fit any sized Barbie toy. Remote control cars don’t just have to be for guys, you know, and this remote control toy is a great way to get a little girl excited about this wonderful hobby. Mario is one of the most enduring brands of recent memory, and Mario Kart is one of the most fun video games ever made, full stop. 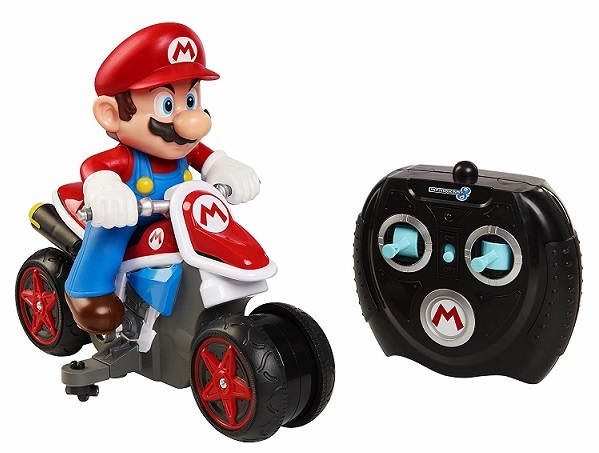 Now you can bring that fun into the real world with this Mario Kart Remote Control Anti-Gravity Motorcycle. 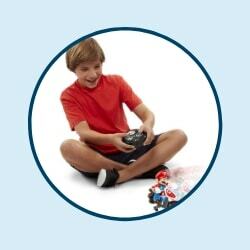 There are quite a few Mario Kart remote control cars on the market, and in fact we were specifically asked if we could include one on this list. We chose this motorcycle in particular because it drives well, is relatively durable, and is pretty inexpensive with all batteries included. It can also change to “anti-gravity mode” by turning the wheels sideways, which allows the motorcycle to drift. Looking for the fastest remote control cars for sale? Traxxas makes cars for adults that speed past any competition at incredible top speeds. The Traxxas XO-1 is the world’s fastest commercially-available RC vehicle, full stop. It can go from zero to 60 miles per hour in 2.3 seconds, zero to 100 miles per hour in 4.92 seconds, and reaches top speeds of over 100 mph. Even Traxxas’ second fastest RC car can only reach 60 miles per hour without modifications, so this is a huge leap in quality. Unsurprisingly, it’s also a huge leap in price. Not everyone will be able to spend $1000 USD on a remote control vehicle. But for those who want the very fastest option around, there’s no substitutes worth accepting. The Traxxas Jato is a Nitro RC car, meaning that it’s powered by nitro engine fuel instead of a battery. Nitro RC cars give you better speed, but are less environmentally friendly and have a distinct fuel smell that some people find distasteful. At any rate, the Jato is very similar to the Traxxas Rustler (our top RC car for sale), except for the aforementioned fuel system, which allows it to travel at a 65 mile per hour top speed. It also has an exceptionally powerful motor and good stability control. If you’re not yet ready to commit to the heft price tag of the XO-1, this is an excellent alternative to the fastest RC car for sale. Rallying is a popular type of racing sport which has unsurprisingly made its way to the RC car market. Here are a couple of the best RC rally cars currently for sale. Yes indeed, it’s another Traxxas remote control car. The LaTrax Electric Rally Racer is a compact model that comes with everything you need to start racing, including a battery and a transmitter, for less than $200 USD. Its powerful motor, completely independent suspension, and all-wheel drive capabilities make it perfect for rally racing in any terrain. 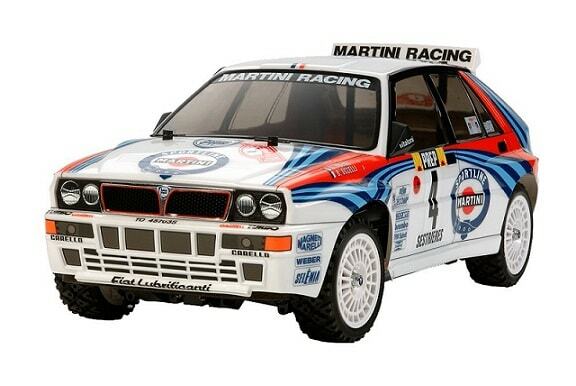 The Tamiya brand Lancia Delta Integrale is one of the most popular remote control rally cars on the market. It has a highly durable design that stands up to most crashes and uses a friction damper to keep the motor from overheating. It has full four-wheel drive and is easily customizable if you’re a serious racer who wants to make some improvements to the base model. And it’s even fairly easy for amateur racers to build and enjoy! How fast can an RC vehicle go? Where speed is concerned, it all depends on the model and brand you choose to go with. It depends on the price, parts used, the weight, the motor, etc. Some of the more expensive RC vehicles can reach up to 60 mph and over, while other models designed for the purpose of racing can go over 100mph. If you’re geared toward getting a RC vehicle that utilizes speed more than anything else, you’ll no doubt appreciate one that is more for racing. On average, however, they typically go as fast as 50 to 60 mph unless specified otherwise. Where is a good place to drive a RC vehicle? The great thing about RC vehicles is that you can drive them virtually anywhere. On the sidewalk, your backyard, or even in your home. Although, depending on where you live you have a ton of options. For example, skate parks and parking lots are great places for driving a RC vehicle. Open fields, for one, are great areas for RC vehicles with raised tires. There are a ton of places to drive a RC vehicle, practically anywhere is good if you give it a try. Where is a good place to race RC vehicles? For the best racing experience possible where RC vehicles are concerned, you’re going to want flat terrain and somewhere that has a long stretch. Track fields, for example, are great places to race RC vehicles. Parking lots, open fields, track fields, and any long, open area have great potential to be a RC vehicle racking spot. Which RC vehicles are the best for beginners? An RC vehicle that is powered by electricity is better for beginners. They are easier to maintain and very easy to understand. Some nitro-powered RC vehicles require methanol, nitromethane and a blend of syntetic oil and castor oil which can be complicated. Another benefit for electric RC cars is that they don’t require vigorous cleaning. Where size is concerned for beginners the starting with small radio controlled cars can sometimes work better. The best scale for beginner RC vehicles is typically between 1/10 and 1/8. If you are completely new to RC vehicles then your best bet is to start with a 1/10, see how you like it, and then go from there later on. These sizes tend to have great value, are easier to carry around, and are more practical in general. Should I get an RC car kit or one that has already been built? Unless you’re a hobbyist with a serious interest in building your own RC vehicle, buying one that has already been built is your best bet. Building a RC vehicle from a kit is definitely not for the faint of heart, unless it’s an entry level one, and even those can be quite complicated. What is the difference between brushed and brushless RC cars? Brushed motors are inexpensive and pretty much get the job done, but they are not as fast as brushless motors. 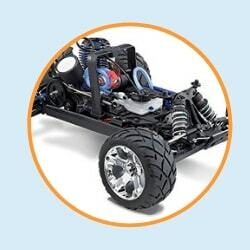 Brushless motor RC cars are faster, more efficient, and can run longer on a single charge of the battery. What’s a bumper, and should I get one? Bumpers save your front and rear end when you crash. Using a bumper doesn’t mean you’re not a good driver, even the pros use bumpers more often than not, so don’t worry. Can you drive RC Cars in water? While most RC cars are unable to go in the water, a RC amphibious vehicle has the ability to go on land or water. What RC Car Tires Are Available? 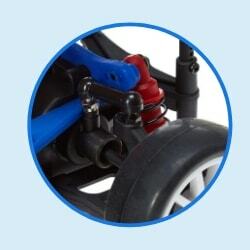 There are lots of different RC car tires available, so if you’re not happy with the tires the vehicle has come with, you can change them out for something different. 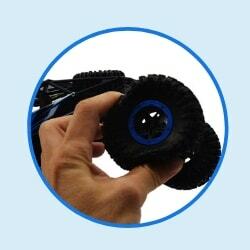 Beginners most likely don’t need to worry about changing their RC car tires. However, experience drivers will often do this based on the terrain that they plan on driving and/or racing on. As previously stated, the remote control car tires you end up choosing should greatly depend on the model of your choosing, where you plan on driving, and the conditions of the weather, terrain, etc. We hope this article has made it easier to find the best RC cars and RC trucks for sale. This is an exciting market that’s only grown in popularity in recent years, and we’re always happy to help beginners and experienced drivers alike find their next remote control car obsession. If you think we missed one of the best RC cars, or if you have a question we didn’t cover in our extensive FAQ, be sure to let us hear about it in the comments!